Bobby Carrot Forever is a tough game to peg. Visually, the pretty landscapes and cartoony characters seem focused on children. The gameplay, though, strikes me as complicated enough to require an older gamer. The game is fun, but has several key annoyances that keep me from loving it. 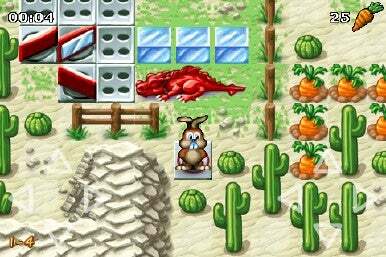 Bobby Carrot Forever features rich, cartoony graphics like this, and puzzles that will challenge an older gamer. A puzzle-based RPG adventure game, Bobby Carrot Forever is impressively designed. You control Bobby — a bunny — and navigate through more than 70 levels. You must collect all the carrots on a given level to unlock the exit. Along the way, you can hop in a bulldozer, fly with a hang-glider, sail on lily pads, and interact with plenty of fun obstacles and bonuses. The first few levels are pretty simple and child-friendly, but the game gets more challenging quickly. On one level, you might need to arrange a series of mirrors so that the fire a dragon spits when you touch his tail will melt the ice that blocks your path. Really. And as you’re arranging those mirrors, you’re stepping on tiles that you may only cross once, since they shoot out spikes once passed, and can never be walked on again. Not surprisingly, you’ll need some trial and error to help you figure out the necessary sequence of steps on increasingly complex levels, and in that respect, Bobby Carrot Forever is forgiving. You can repeat each level as many times as you need. After a few levels, you’ll get treated to a bonus round where you can collect extra coins. You can exchange those coins for all sorts of power-ups, like sneakers to help you cover more ground faster. You will accidentally step on spikes, by the way. That’s because of Bobby Carrot Fever’s single biggest weakness: Its controls. The game currently offers several control modes, and you can switch modes at any time. In one setup, you tap on an edge of the screen in the direction you want Bobby to go. In another, you tap and hold and Bobby walks towards your finger. I expected to prefer on those two methods, but actually found that I was most comfortable with Option 3: A virtual gamepad that appears in the bottom corner of the screen. Even the directional pad was a little stickier than I wanted. The music here is good, and there are tons of tracks. The polish in this game is apparent; you’ll likely find yourself thinking of some of Mario’s earlier side-scrolling adventures on Nintendo consoles from time to time as you play. When the controls cooperate, gameplay feels good: Floating along on a lily pad or sliding on ice really feels right — and fun. This is the video game equivalent of a page-turner: I really want to know what clever obstacles await me on the next level. With some improvements to the controls and perhaps mid-level save points, Bobby could go from good to great.